Cacao originated in the Amazon River basin and is now grown in tropical regions around the world. The genus name Theobroma means “Food of the Gods” in Latin. 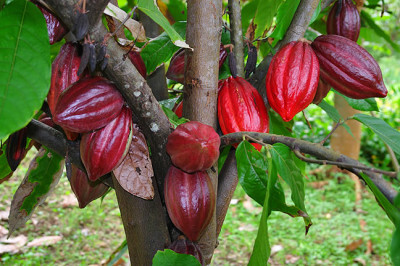 The cacao tree produces pods containing 20-60 seeds usually called ‘beans’. Inside the pods these seeds are covered with a mucilaginous pulp that is carefully fermented to separate the seeds from the pulp. This art of fermentation reminds me of brewing beer where variations in temperature and moisture content create significant differences in the flavor of the bean. Cacao pods growing on a cacao tree. I use cacao nibs to make Chicaoji. Cacao ‘nibs’ are simply cacao beans that have been cracked into little pieces. They’re usually used to make chocolate. Cacao is called a “super food” because it is very high in antioxidants. You may have heard how dark chocolate is good for you. Well, raw cacao is the “good for you” part. The milk, sugar, and other additives to chocolate (the -olate in chocolate refers to milk) only dilute the benefits. Cacao by itself tastes slightly bitter and the goji berries weave a sweet and sour complexity into the flavor. Agave nectar’s sweetness balances raw cacao’s flavor. I use raw cacao because roasting may diminish the benefits. I use organic cacao nibs from PacariSKS Farms, makers of Pacari Organic Chocolates, to make Chicaoji. Pacari is a family owned business that works with small scale family farms in Ecuador. They use organic production methods and are the only chocolate company that has the Demeter Biodynamic Certification. Read the Pacari story to understand why I use their raw cacao. I recommend Healthy Goods (aka Live Superfoods) in Bend, Oregon if you want raw cacao (without buying Pacari’s 30+ pound minimum order), Healthy Goods is an excellent source for all sorts of organic, raw, vegan and generally healthy foods, personal care products, supplements, books and so forth. I bought cacao from Live Superfoods when I was buying cacao in single pound quantities. Live Superfoods.com provides information about raw cacao you might find interesting. 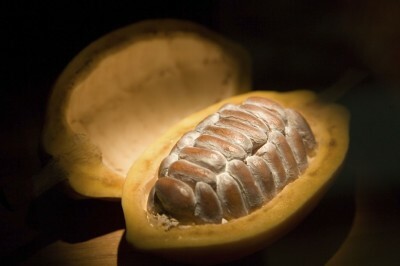 Briefly: they explain about the antioxidants, neurotransmitters, essential minerals, and fats in raw cacao. Also, they provide some history of and uses for raw cacao. I’ve always liked very dark chocolate and took to cacao nibs right away when I discovered them. I enjoy eating them on all sorts of food, in trail mixes, and just out of hand. The first time I tasted cacao nibs and goji berries together was the spark that inspired Chicaoji. See the story of Chicaoji. I looked around for just the right sweetener for Chicaoji. I chose agave nectar for a couple of reasons. I like its complex flavor. Customers find agave nectar’s relatively low low glycemic index valuable and desirable. I like that the agave is organically produced. I purchase Chicaoji’s agave nectar from GloryBee. GloryBee agave nectar is available at many food coops and natural food stores. Here’s a link to their store locator. Interestingly, the production of agave nectar is very similar to how a bee creates honey. The bee adds enzymes to the complex sugars of nectar, which changes it into the simple sugars making honey. It is also through enzymatic action that the complex sugar found in agave juice is changed into a simple sugar sweetener- Agave Nectar. Agave nectar is a newly created sweetener, having been developed during the 1990’s. Originally, the blue agave variety was used. This is the same plant used in the manufacture of tequila. During the late 90’s, a shortage of blue agave resulted in huge increases in cost and a sweetener based on this plant became uneconomical. Agave Nectar has many fine qualities. Foremost among them are the certified purity, both organic and kosher. Also of note is the flavor. The light variety’s neutral flavor will not alter the taste of the foods in which it is used making it ideal as a sweetener for coffee, tea, fruit “smoothies”, and other beverages. The amber variety’s mild natural flavor will lend a delicious and mysterious hint of flavor to sauces or baked goods. This sweetener is also very convenient to use, as it has a long, stable shelf life and will not solidify. It pours quickly even when cold, blends and dissolves readily in or on all foods. For baking, its moisture retention properties are comparable to those of honey. Bakers also may notice a silky, smoother texture to their goods and better definition of other natural flavors. Limiting glucose consumption is a contemporary concern for many people. The introduction of this new sweetener is timely as it has a relatively low glycemic index due to its higher proportion of fructose and lower levels of glucose. This fact should prove attractive to those with special diet considerations or who monitor glucose intake. This is a relatively new concept which can be important from a metabolic standpoint, especially to diabetics, along with athletes and grossly overweight individuals. The index is an indicator as to how much your blood sugar increases in 2-3 hours after specific food consumption. Most if not all carbohydrates are normally metabolized into the simple carbohydrate glucose, which in the glycemic index concept is arbitrarily assigned a value of 100.As a result, the higher a glycemic index food number is, the faster it raises your blood sugar level. Foods or ingredients with glycemic index numbers close to or above 100 present some significant health issues to diabetics, and in general, sweeteners of all kinds should be avoided by diabetics. Nonetheless, for those diabetics who choose to consume certain amounts of carbohydrates, Agave Nectar, it should be noted has a lower glycemic index than honey. Agave Nectar was found to have a glycemic index of 32. In contrast, honey has a reported glycemic index of 58, due to its higher ratio of glucose to fructose, as compared to the ratio of glucose to fructose in Agave Nectar.Please note: these values are based on using glucose as the reference point, which is the currently accepted approach relative to reporting glycemic index. Earlier, white bread was the reference point, but white bread composition can vary widely, and thus glucose is now the preferred base product. Click here to visit the GloryBee site for more detailed information. Chicaoji is made with certified organic apple cider vinegar (ACV). I chose ACV for its taste and for the health benefits, known since the times of the ancient Greeks. You may already be familiar with ACV used as a daily tonic. I obtain Chicaoji’s delicious apple cider vinegar from Spectrum Organics or Azure Standard, a natural and organic food distributor. Broadly divided into two categories, the Mother of Vinegar consists of yeasts and bacteria. The yeasts come along first and break the apple sugars down into carbon dioxide and alcohol in an anaerobic (without oxygen) environment we call fermentation. It is at this point known as “hard cider”, a beverage enjoyed by people world over. Hot on the heels of the yeasts are the acetobacters which are bacteria that in an aerobic (with oxygen) environment break down the alcohol into acetic acid among other things. Acetic acid is the sour part of vinegar. It’s a really cool process that involves Tribes of organisms that are absolutely fundamental to Life. Without the fungi (yeast are part of this Tribe) land based life forms would not likely exist. Without bacteria none of us would exist. Eventually, I hope to use a local or regional apple cider vinegar to make Chicaoji. The San Juan Islands are a wonderful fruit growing region. Before irrigation of the farmlands East of the Cascade Mountains and the development of the interstate highway system, this region produced fruit abundantly and was called the fruit basket. You can find old orchards dotting the rural landscapes all over the region. There is a movement to inventory and propagate these old trees to save the old varieties, some call it the Heritage Fruit Tree Project. I hope your desire for Chicaoji will translate into a market demand for apple cider vinegar in this area and that this this would, in turn, translate into demand for apples, apple based products, and processing infrastructure. I hope for that fresh/dried/frozen fruit, fresh cider, hard cider, fruit spirits, sauce, sweeteners, jams, jellies, and vinegars will provide livelihoods for generations. Alpenfire Cider near Port Townsend, WA is about as close as we have to a local apple cider vinegar at this time. They produce a delicious organic apple cider vinegar but the demand for their locally grown organic cider consumes their supply so they don’t have enough to supply Chicaoji. Their vinegar is unique and awesome.